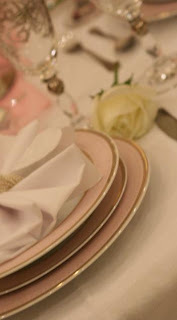 This is a close up shot of the crockery/cutlery/glassware. Since the table was predominantly pastel shades of pink, I placed white roses at each individual setting to break up the color. White roses are my favourite. I can use them everywhere. Yes, I like having the foreground in my photographs blurred. Similar trick done with the chairs as I did for the tea party! These sashes have little cream- coloured pouches with potpourri in them strung to the knot. Another closeup of the rose and glassware. What this side of the table looked like. The glasses. Those papers in them are the placecards! What an individual setting looked like. I would love to post pictures of the centerpiece which was a wickerbasket filled with flowers in a contrasting HALF and HALF theme.. half of the basket had an abundance of pink, white, and yellow roses, chrysanthemums, and carnations and the other half just had leaves and some baby's breath (breadth? sp?) There were also cream colored candles scattered around. The pictures of the centerpiece TURNED OUT CRAP. So I won't upload them :) Enjoy.